TRAIL BOSS Anthony Bruno expresses his grief to an interviewer, after one of the founders of the Northeastern Trail died of a heart attack the morning before they camped in Houston. 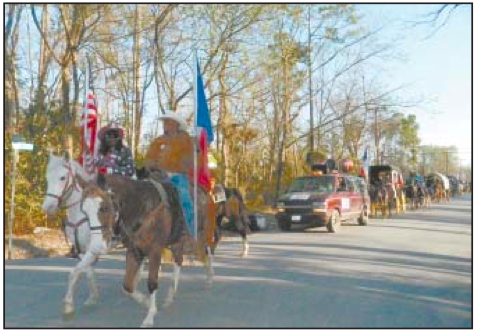 Northeastern Trail Ride included 12 wagons and almost 300 riders from the area. 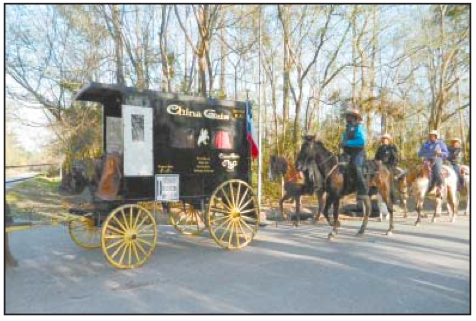 ON THE TRAIL – Thirteen Trail Ride groups started toward Houston and the big Houston Livestock Show & Rodeo last week. One of these ride groups was the Northeastern Trail Riders, starting in Cheek, Texas on February 23rd. The group consists of 12 wagons, about 300 riders, and lots of support vehicles and campers. The Trail Riders covered 108 miles in their ride, stopping in Cheeks, Devers, Raywood, Dayton, Crosby, and North Forest in Houston. Thursday they travelled down old US90, Beaumont Highway, stopping at Sheldeon Ag barn and greeting the North Shore public along the way. 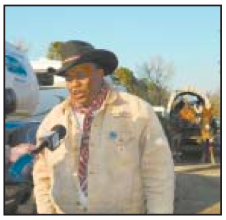 In Crosby they had camped overnight at the Fairgrounds on Wednesday night, Feb. 26th. The next morning, Thursday, they broke camp and headed for their next to last stop in Houston. 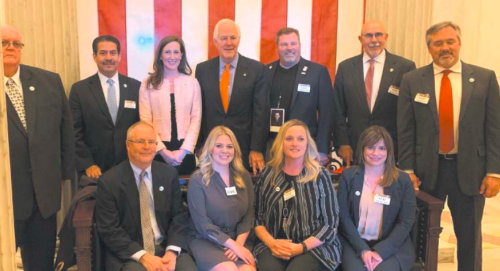 However, they received word that one of their group, Robert Joe, 79 had suffered an apparent heart attack that morning at the campgrounds on Parker, and was taken to LBJ hospital, where he was pronounced dead. Joe was one of the last two founders of this trail ride group, who with eight friends has started it in 1982. Association secretary Barbara Williams said that Joe told his son and wife he was hurting, and they called an ambulance. In honor of Joe, the trail ride continued with his wagon as part of the parade. Coincidentally it was styled to resemble an old hearse, painted in black. Later in the day current trail boss Anthony Bruno recalled Joe’s contributions, and how he was an important part of the Northeaster Trail Ride association. RIDERS from the Northeastern Trail Ride near their last stop, at the Triangle 7 Arena on Parker Road in Houston. They spent the previous night camped at the Fairgrounds in Crosby, Texas. THE WAGON HEARSE of Robert Joe continued in the Trail Ride, after the untimely death of Mr. Joe. After leaving Crosby, the riders continued down Beaumont Highway, making stops at the Sheldon ISD ag barns on old US90, and stopping at several schools along the way to talk with the students and introduce them to horses and the concept of the old West. 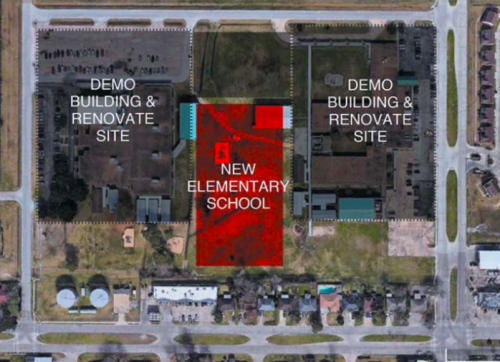 Schools they stopped at, from their preliminary schedule, included Hilliard Elementary, KIPP Academy, B. C. Elmore, and Bruce Elementary. After leaving the Triangle 7 Arena on Friday morning, they proceeded to Liberty Road, the frontage road of US59, and finally to Memorial Park around 3:30 p.m. on Friday afternoon. Each leg of the 108 mile journey was planned to be about 20 miles, and took six days for the whole trip. Along the way, the rider attempts to teach school children the history and heritage of the American Cowboy, as well as the contributions of the African American Cowboy and others. The Northeastern Trail Riders always stop at the Triple E Workshop, in the Sheldon Ag barn, because this company manufacturers buttons for many of the trail rides that come from Louisiana, Texas and Arkansas. The Northeastern Trail Ride has awarded scholarships for continuing education in the AgriBusiness over the years, and has also formed their own 4-H program. Trail Boss is Anthony Bruno, Assistant Trail Boss is Henry Charles, and Secretary is Barbara Williams. Even though this ride starts in Cheek, Jefferson County, many of the riders are actually from the Houston, North Shore, Sheldon and North Forest areas of the city. The ceremonial events in Memorial Park on Friday evening include an award for Best Trail Ride in various divisions, by size. There is also a Spirit Award. The Northeastern Trail Ride has won the Best Trail Ride award in 1997, 2003, and 2007. The Trail Ride emulates the important cattle drives of the last century, and as such is a learning experience for the riders and the public. The 13 trail rides meet together in Memorial Park on Friday, and after an evening of camaraderie and awards, prepare to go into downtown on Saturday morning and participate in the Downtown Rodeo Parade, the official start of the Houston Livestock Show and Rodeo. The 13 trail rides involve a total of over 3000 riders, from as far away as 386 miles, from Reynosa, Mexico.